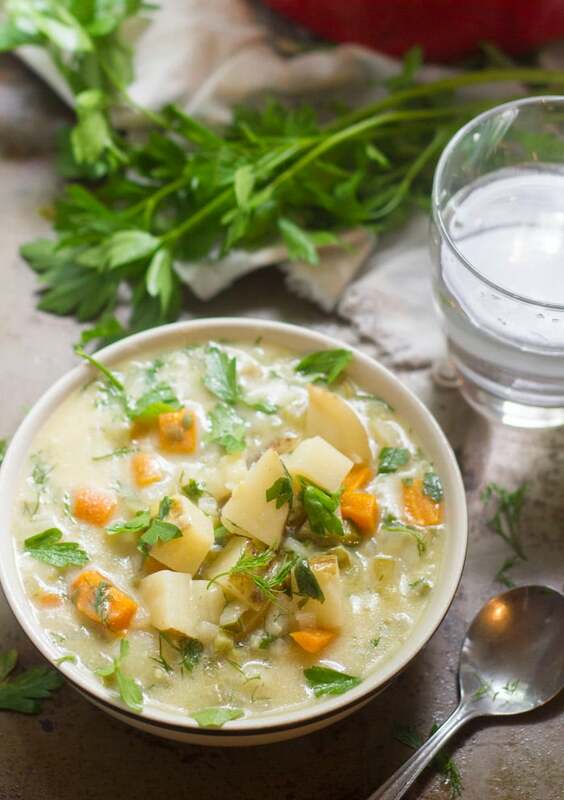 Creamy potato soup is simmered up with tangy dill pickles, tender veggies, and fresh dill to create this unusual, but totally delicious, vegan dill pickle potato chowder. It’s been a weird week. Is anyone else feeling this? Between having a holiday on Monday, followed by a bunch of cold rainy days that don’t quite feel right for this time of year (it’s technically still summer), my head is in a bit of a funk. Not that I’m complaining about holdays or cold rainy days! I love both! But I’m definitely a little discombobulated. I’ve had to ask my husband at least three times what day it is. So today I’m sharing a weird soup. I’ve been hanging on to this one for a while, precisely because of its weirdness. Last winter at some point dill pickle chowder was on the menu at a local takeout place. My husband shocked the heck out of me by ordering it. It wasn’t vegan. I always thought I was the more adventurous one, and diary or not, I would’ve turned my nose up at such a thing. But apparently it was awesome, and curiosity got the best of me, to the point that I had to whip up a dairy-free version at home. I did a little research, and apparently dill pickle soup is a Polish thing. I’m not sure how close my version comes to an authentic polish version, except I’m pretty sure the inclusion of soy or almond milk is pretty darn inauthentic. It is however, delicious. Another reason I held off on this recipe was because I wasn’t sure how well it would go over with you guys, weirdness and all. But couple of weeks ago I shared a recipe video for dill pickle hummus on my Facebook page and everyone flipped out over it. So maybe you’re all down with a little pickle-y weirdness after all? I hope so, because you really need to try this soup! 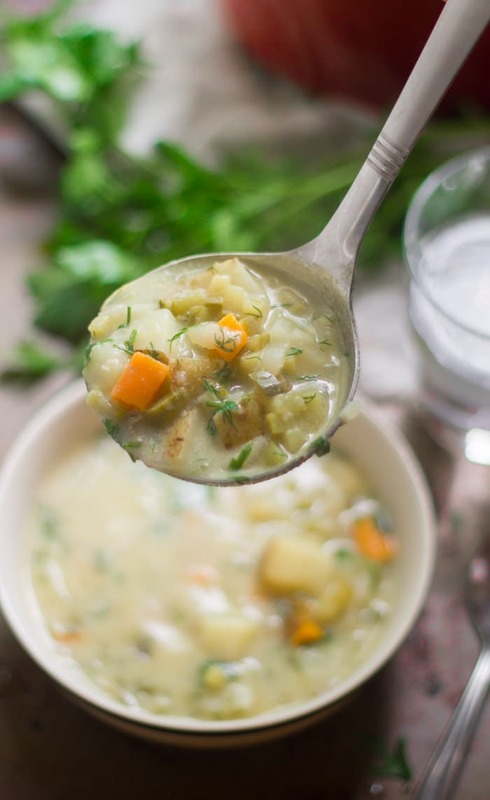 This dill pickle chowder is a lot like my mom’s potato soup that I ate growing up, but with dill pickles. If you like creamy soup, and you like dill pickles, you’ll love this. All in all, I’m glad things got a little crazy this week. It’s the perfect excuse to share what I consider to be a pretty off-beat soup. Coat the bottom of a large pot with olive oil and place it over medium heat. When the oil is hot, add the onion and carrot. Sauté until the carrots begin to soften and the onions are translucent, about 10 minutes. Add in the garlic and sauté about 1 minute more, until very fragrant. Then add in the flour and stir to coat the veggies. Stir in the milk, broth, potatoes, pickles, and nutritional yeast. Raise heat and bring to a simmer. Lower heat and allow to simmer, uncovered, until the potatoes are tender, about 20 minutes, stirring occasionally. Remove from heat and stir in the pickle juice and the dill. Season with salt and pepper to taste. Ladle into bowls and serve, optionally with a few pickle slices for garnish and a sprinkling of fresh dill and parsley. Hi Alissa, In my neck of the woods (Michigan) Dill pickle soup is very popular as are fried dill pickles. Can’t wait to try your version. Especially since the temperature here has been dropping. This looks amazing! I grew up eating dill pickle soup on Christmas and cannot wait to try this. Thank you, Alissa! Thanks so much Sarah! I hope you enjoy it! Do you use kosher dill pickles and juice or regular? Made this tonight. I love pickles, but wasn’t sure if this would work. Delicious! Thanks for a great recipe. Yay!! I’m so happy you both enjoyed it! Thanks Val! 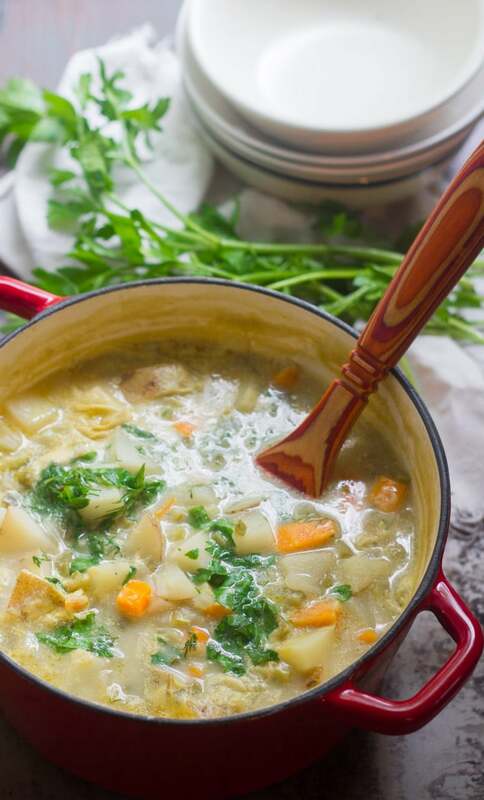 Looking to make this soup for a group including DF and GF folks. Wondering about the flour, with the starch from the potatoes, would I be okay omitting it? Or something you would suggest in its stead? You might be okay omitting it, but if the soup seems too thin without it you could try making a slurry with the broth and a bit of arrowroot powder. I hope you enjoy! I’ve seen recipes that call for almond flour as a thickener, so I think it would work. I’ve never tried it myself though, so I can’t be 100% sure! Oh wow! I had no idea! I’ve updated the recipe to make sure that doesn’t happen to anyone else. Thanks Michelle! I made this for dinner last night and I can’t stop thinking about how delicious it was! I’m going to be making it again very soon. I was wondering if you think it’s freezable? Thanks!! I’m so glad you liked it!! I’m not sure, but I have heard that freezing potatoes changes their texture, so that’s something to watch out for. If you do give it a try please let me know how it works out! Just copied your recipe for this pickle chowder, sounds yummy. When you stir in the broth, potatoes, milk and pickle juice, did you mean pickles not juice? At the end of the recipe you wrote again stir in pickle juice and dill. I did! Thank you for catching that!! This recipe sounds wonderful, will be trying it soon! Yay!! I’m glad you like it! Enjoy! That’s awesome!! I’m so glad you enjoyed it! This soup is so YUMMY!! I really need to double up recipe next time I make it!!! Yay!! I’m glad you enjoyed it! Made this today for lunch and it was great! I used water instead of vegetable broth, so I had to be generous with the salt and pepper and added an extra splash of pickle juice. I also threw in a can of chickpeas to make it more hearty. Turned out great! Chickpeas sound like a delicious addition! I’m glad you enjoyed it! Thank Rachel! Thought this sounded odd. Made it. It is amazing! The flavor of the broth is absolutely incredible! Added more dill than what was called for because…dill. Recommending this to everyone I know. I was shocked myself! So glad to hear you enjoyed it though! Thanks Christine! A very good recipe, however, I think I’ll use coconut milk next time, I wasn’t a fan of the soy flavor in this chowder. But it didn’t ruin the dish, was still very tasty just personal preference! Glad you enjoyed it! I think any unsweetened and unflavored non-dairy milk should work here – coconut milk should give you a nice creamy soup! Probably really dumb question but do you need to use nutritional yeast? This looks incredibly yummy! Thank you! I made this based on other good reviews, but I definitely did not like it. Almond milk made the broth taste sooo weird, and mixed with the pickle juice made it even worse. Maybe soy would have worked better. Even my husband who likes dill pickle soup could eat it. Maybe it was just a difference of preference, but I would not reccomend the soup if you are even a little unsure if you’ll like the flavour. I’m sorry to hear that! It could be the brand of almond milk you used. 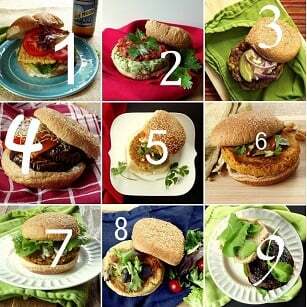 Make sure you’re not using something with added flavors or sweeteners – that will definitely make it taste weird. 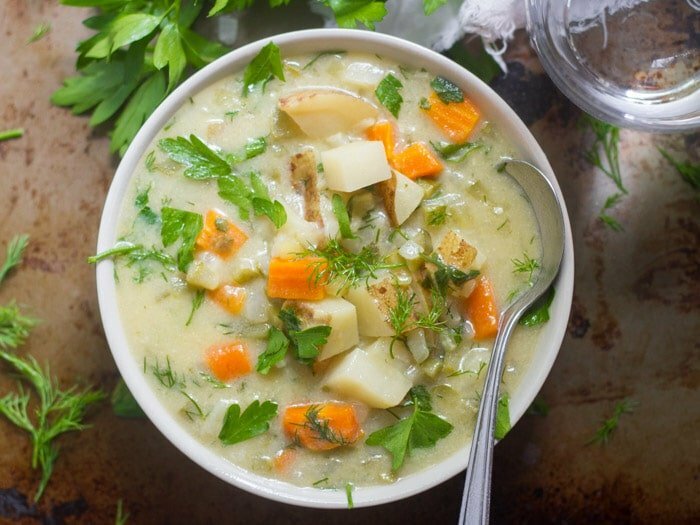 I just had the ‘Dilly Dilly Potato Chowder’ from Zoup and am looking for a clone of their recipe. Do you or anyone know how this tastes in relationship to Zoups version? Theirs was delicious! Thank you ahead of time.